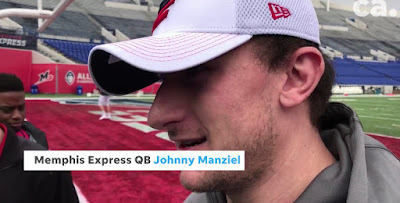 Everyone is talking about Johnny Manziel's first session with the media as a member of the AAF's Memphis Express. His comments are being examined six ways from Sunday, and many feel he was taking a shot at the CFL when he explained how much he's enjoying a return to American rules football. "Not seeing a 12th guy on the field, and not seeing an extra person. This is what I've done my entire life. This is back to the football that I know; protections, run game, the coverages. I know what I'm doing. I've played two years at a very high level and as high level as you can play in college football. I've learned this game to a point and that's the biggest thing. It's back to what I've known my entire life. It's not learning a new game. That's what it is." As far as the rest of his session went, Manziel was happy with his first day. "Fun day! Good practice," Manziel revealed. "I thought there was a lot of energy. Thought we did some good things. Fun. Everyday is going to keep getting better. Keep coming out and do what I can do to try and give my best everyday. It's all about effort. Come out, put all the effort in, put the time in in the playbook and come out and see if you can't execute on the field. Manziel was asked if he's simply happy to have the pads back on. "Yeah just the whole, what this is," Manziel shrugged. "Being around a team, being out having organized practices, getting reps, throwing routes, getting back into the mix. Felt a little bit rusty today but that'll wear off with getting to know these guys and getting to know the system a little bit better. As the days go on, each day will be better and better. I can promise you that. "What I can do is come out and give good effort. I can come out and put time into my playbook, making sure I know things like the back of my hand. Come out and keep working everyday whether it's footwork, whether it's ball-placement, whether it's getting the ball to come out of my hand a little bit better which I feel it didn't come out as good as I normally throw it today. A new environment, a little bit windy, no excuses but I'm going to keep working at it everyday." Could aspirations for expansion and rising salary costs and the major difficulty for star quarterbacks from American colleges adapting to the CFL game mean that someday down the road the CFL will drop from 12 to 11 players on the field? It would be very interesting to see how the game would change if this was to happen. I have ZERO problem with what he said. I agree with Russell. I don't take any offense to anything that he said there. Not a fan of him by any stretch and if I felt it was offside I'd be the first to say so but I don't think that was in any way shape or form carving up our league. Not disappointed to see him go however. Overhyped from the get-go and never really did anything to endear himself to the league. I generally like to cheer for an underdog but they have to give me a reason to believe. He basically never really got comfortable with our game is all I took from that. This sounds like he is admitting he could not figure out the CFL game. It must have been too complicated for him! I think all he did was admit he's too dim to play Canadian football.